Question: Respected doctor, am 26 years old married woman, still no kids, am suffering with irregular menses for last 7 years, because of this am gaining weight, and tummy also becomes very big, i have taken many Treatment but no effect, Doctors said its due to PCOS, PCOD, Why irregular menses happens? Is there is any treatment in Homeopathy system of medicines for POLYCYSTIC OVARY SYNDROME, Disease PCOS, PCOD? 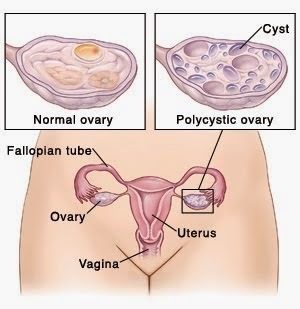 Doctor Answer: Dear madam, No worries, Homeopathy treatment helps for you, please find the complete details about POLYCYSTIC OVARY SYNDROME, Disease PCOS, PCOD below. Proper homeopathy treatment helps you to get rid of this Poly Cystic Ovarian Syndrome, Disease. Do women with Polycystic Ovarian Syndrome (PCOS) have trouble with their menstrual cycle? Fertility Medications. The main fertility problem for women with PCOS is the lack of ovulation. Even so, her husband’s sperm count should be checked and her tubes checked to make sure they are open before fertility medications are used. Clomiphene (clomid) medication and gonadotropin injections can be used to stimulate the ovary to ovulate. PCOS patients are at increased risk for multiple births when using these medications. In vitro Fertilization (IVF) is sometimes recommended to control the chance of having triplets or more. Metformin can be taken with fertility medications and helps to make PCOS women ovulate on lower doses of medication. Medicine for increased hair growth or extra male hormones. If a woman is not trying to get pregnant there are some other medicines that may reduce hair growth. Spironolactone is a blood pressure medicine that has been shown to decrease the male hormone’s effect on hair. Propecia, a medicine taken by men for hair loss, is another medication that blocks this effect. Both of these medicines can affect the development of a male foetus and should not be taken if pregnancy is possible. Other non-medical treatments such as electrolysis or laser hair removal are effective at getting rid of hair. A woman with PCOS can also take hormonal treatment to keep new hair from growing. Symptomatic Homoeopathic medicines works well for PCOD/PCOS. Homeopathy medicines acts best Without any side effects, Symptomatic Homeopathy medicines helps to regulate the menses cycle, reduce the weight, controls facial hair growth.